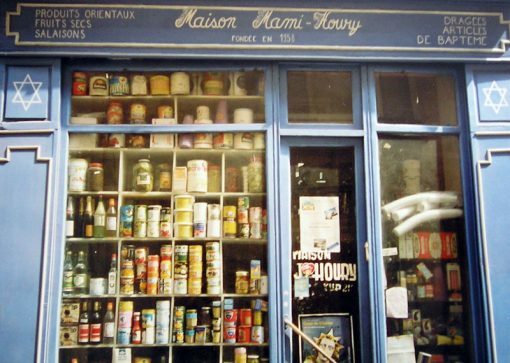 Le Marais, One of Paris’ oldest districts is worth exploring . This charming part of town is where you can truly experience the Paris of the past. Unlike the rest of the city with its signature broad imposing boulevards created by Napoleon and Haussman, Le Marais has small narrow streets of the medieval era. The architecture is also of the medieval an d renaissance times. The district has become very fashionable and the in place to be in the city. There are great shops, restaurants and art galleries. There is a wonderful Jewish quarter which still retains much of the original traditions and charm. 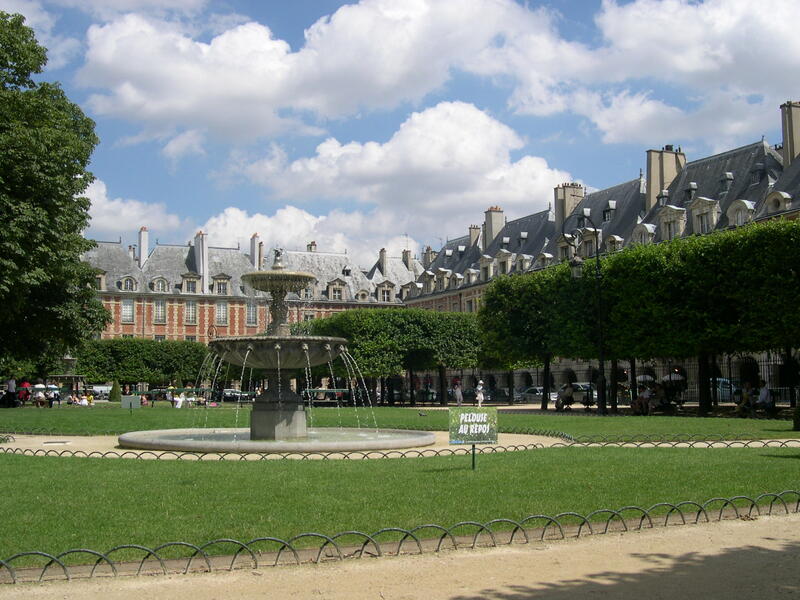 The Place des Vosges one of the most beautiful squares in Paris is the center piece of the district. The stunning square is surrounded by beautiful buildings , a park with a wonderful garden is the center and underneath archways are many shops and cafes. 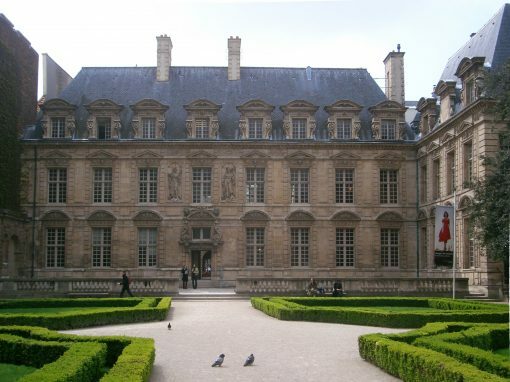 Number 6 Place des Vosges is famous because Victor Hugo lived there while he wrote Les Misérables. Other infesting things to see in the area are: the new Opera house, the Carnavalet museum which houses the history of Paris, and the Picasso museum. 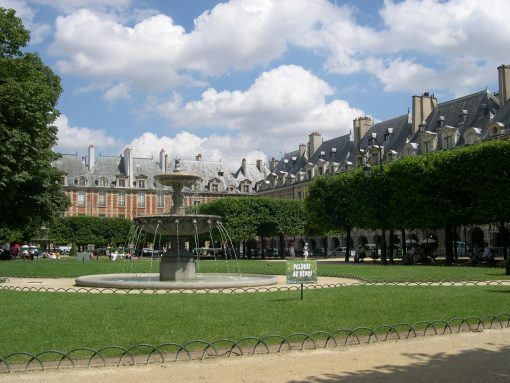 Characteristically seen to be an urban planning, Place des Vosges was designed by Baptiste du Cerceau. The symmetrical design resembles a square with buildings all around. These buildings have an interesting mix of white stone front porch, red brick exterior and vertical slate dorm windows and roofs. It was under the command of King Henry IV in 1604 that the building saw its Royal pavilion being constructed at the southern end of the square. Replicating the King’s pavilion on the southern side of the square, the Queen’s pavilion regally stands at the northern side of the square. The King’s pavilion is believed to have been constructed atop a gateway. Interestingly, it was commanded by the King that 35 buildings surrounding the square would also be made in the same fashion. 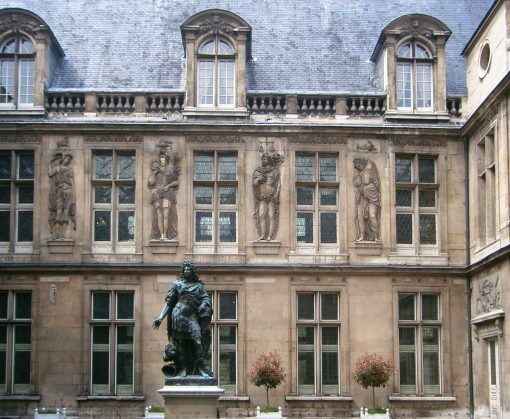 In 1388, the northern portion of the square saw a major construction in the name of ‘Hôtel de Tournelles’. Until 1559, this grand edifice served as the home of the Royal family. During the time at an event held at the Hôtel de Tournelles left the then King Henry II injured and succumbed to the injuries in the next ten days. 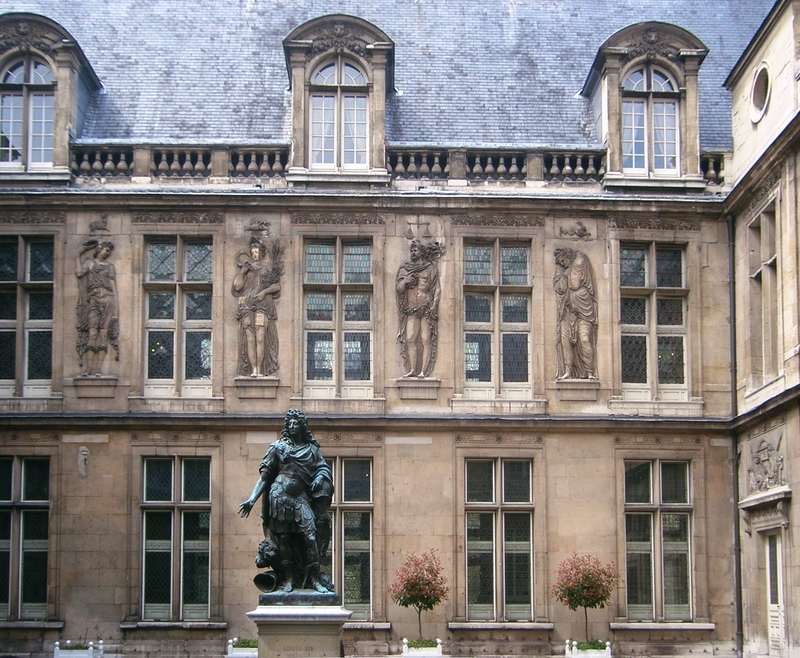 The King’s wife, Catherine de Medicis, demolished the building and replaced it with the Statue of King Louis XIII at the Place des Vosges. Later on the same statue was shifted to the Louvre. It was a much favourable lawn that was picked for duels at the time that it was inaugurated, that is, in 1612. This square was officially named the ‘Place Royale’. While a statue of King Louis XIII was established in 1639 by Richelieu right at the heart of the square, it was ruined during the French Revolution. However, now a new statue of King Louis XIII stands which was duly inaugurated in 1825. It was after the name of the first tax payment department of France that the Place Royale was named by Napolean in 1800. He changed the name to ‘Place des Vosges’ as a gesture of gratitude to the Vosges taxpaying department. The name was again changed back to Place Royale in 1815. However, in 1870 it was again changed into ‘Place des Vosges’. As the name suggests this place was home to the renowned Victor Hugo and other celebrated Frenchmen like Richelieu. The once residence of the author of ‘Hunchback of Notre Dame’, ‘Maison de Victor Hugo’ has been converted into a museum now. Visit the place whether you are a fan of Hugo or not; it still has the rooms of the author open for visits where he had brought forth the famous historical novel ‘Les Misérables’. You can also find other items of interest like his artwork, souvenirs and books from the time when he was a child to the time when he was in exile.